Your speedometer provides valuable information as you drive a vehicle, much more than just avoiding a traffic ticket. 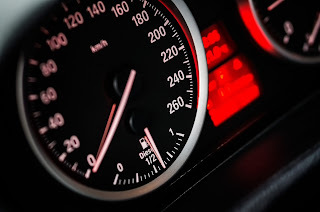 Knowing your accurate speed helps you measure your velocity as you enter curves, and helps give the driver a gauge for the distance it will take to stop at higher speeds. Speedometers are calibrated to ensure that the torque created by the magnetic field is accurately reflecting the speed of the vehicle. One important part of that calibration involves the diameter of the tires. When an axle makes a complete 360 turn, the tire connected to that axle makes a revolution. However a tire with a larger diameter will travel more distance than a different tire that has a smaller diameter. For example, a tire with a diameter of 20 inches could cover about 63 inches of ground as it makes one revolution, while a larger tire with a 30 inch diameter might cover about 94 inches. Your vehicle’s service manual will recommend the proper size of tire for your car, truck or SUV. Be cautious about changing that tire size. Always consult with a qualified service advisor about the size and type of tire suitable for your vehicle. If any changes to tire size are made, it’s a good idea to have the vehicle serviced and the speedometer tested to be sure it is correctly calibrated. For any questions about vehicle service, contact the Melloy Dodge Service Department, located at the Melloy Dodge dealership, 9621 Coors Blvd. NW in Albuquerque. The service department can service all makes and models, and will be sure to follow manufacturer protocols.